The early years of the United States Mint were fraught with problems: The equipment was crude, serviceable die steel was difficult to obtain, and until 1816, men and horses, not steam, supplied power to operate the machinery. But one of the most serious problems facing the new enterprise was a lack of experienced personnel, particularly in the area of design and engraving. When the Mint began operations after the Coinage Act of 1792, employing suitable officers and workmen became one of the first priorities. As early as 1790, Secretary of State Thomas Jefferson (then the Cabinet officer in charge of the Mint) had been attempting to recruit qualified artisans from European cities where minting methods were state of the art. Jefferson had attended an exhibition at the Paris Mint in 1786, where he observed the operation of an improved coining press and was quite impressed with the machine and its inventor, French engraver Jean Pierre Droz. Droz’s methods were at the cutting edge of late 18th-century technology, and Jefferson was determined to retain his services for the proposed United States Mint. After some initial correspondence in 1786-87, the matter was tabled, as Droz apparently needed immediate employment and the Mint’s opening was still several years away. In 1790, negotiations with Droz were resumed and initially he accepted Jefferson’s offer, but later he declined, citing personal reasons. As the new Mint facility in Philadelphia began to take shape, a talented engraver was still to be found. Coiners Henry Voight and Adam Eckfeldt assisted in the preparation of the first dies, but it was not until August 1793 that the artist Joseph Wright was appointed as engraver. Unfortunately, Wright died a few weeks later from yellow fever, in the annual epidemic that struck Philadelphia in the summer months. He was succeeded by Robert Scot, an English watchmaker and banknote engraver of some repute. Scot’s talents as a die engraver, however, were marginal at best. 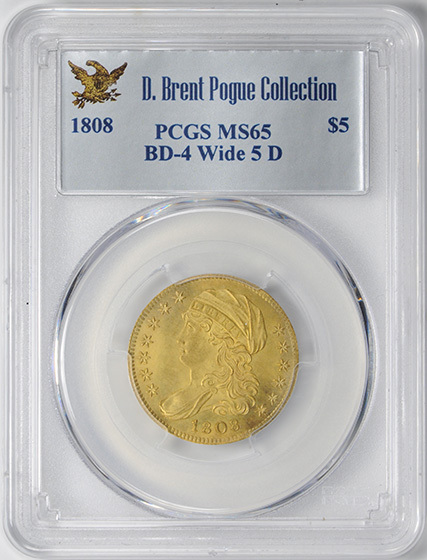 Many of his early coinage designs received widespread criticism, putting him on the defensive from the very beginning. Apparently fearing competition, he thwarted every effort by Mint Director Henry DeSaussere to engage an assistant engraver. When John Smith Gardner was finally appointed to that position at the end of 1794, he lasted only 16 months, probably due to Scot’s jealousy and harassing tactics. For years, Scot’s authority and position would go unchallenged, and his designs continued to reflect his limited skills. Probably his best work is his 1795 design for the first half eagle, with its Draped Bust portrait of Liberty and its small eagle on the reverse. The small eagle gave way to the heraldic eagle in 1798, but by the turn of the century, Scot’s failing eyesight increasingly limited his usefulness as an engraver. During this era, thousands of immigrants began to arrive on the shores of the United States, including many refugees of the Napoleonic Wars. One of these emigres was John Reich, a German engraver who sold himself into indentured servitude in return for passage to America. By 1801, his skills were renowned in Philadelphia, even to President Thomas Jefferson, who recommended to Mint Director Elias Boudinot that Reich be employed. Boudinot complied, but apparently in deference to the excessively territorial Scot, Reich was not allowed to design coins but was assigned other miscellaneous tasks. Scot was 62 in 1807 when the new mint director, Robert Patterson, implored Jefferson for permission to formally hire Reich. By this time Reich was so disgusted with doing menial tasks at the Mint and enduring Scot’s jealousy that he was ready to return to Europe. Patterson was not about to lose Reich’s services, and offered him the permanent position of assistant engraver at a salary of only $600 per year—half of the $1200 Scot received. Patterson immediately assigned Reich to revamp all the coinage designs. He began with the half dollar and half eagle, the two “workhorses” of commerce in that era, preferred by banks for international payments and reserves. The Capped Bust motif Reich created for the 1807 half eagle features a buxom Miss Liberty facing left, flanked by seven stars to the left and six to the right. She is wearing a cloth cap inscribed LIBERTY, with curly hair falling out from the edge of her cap down to her shoulder. Reich’s Liberty has a distinctly European look, completely different from any previous depiction. When the coins entered circulation, newspapers of the day sardonically reported that Reich’s rendition was actually modeled after “the artist’s fat mistress.” Although the designer’s initials were not on the coin, almost all of Reich’s obverses have a characteristic notched point on the lowest star on the right—as his “signature.” On the half eagles, the notch faces the coin’s border. His reverse design depicts an eagle with outstretched wings, perched on a palm branch and holding three arrows in its claws. The motto E PLURIBUS UNUM appears on a ribbon above the eagle, and the inscriptions UNITED STATES OF AMERICA and 5D. surround the central design. One of Reich’s innovations was to place the denomination on gold and silver coins. Except for the copper coins and the 1796-97 half dollars, earlier designs had no indication of value, commonly passing by weight and fineness. No dates in the series are very rare, and most specimens are found in grades from Extremely Fine to About Uncirculated. Mint State pieces are regularly available, and some gems occasionally appear—usually the 1807, 1809/8, 1810 or 1812 issues, the latter two dates surfacing in old hoards. In the past, this series was a target of counterfeiters and many dangerous pieces still exist: Any questionable specimens should be authenticated. Wear first shows on Liberty’s hair and cap, and on the eagle’s wing tips, neck and claws. In 1813, Reich eliminated the bosom and drapery of Liberty and rearranged the stars, creating the Capped Head design. He quit in disgust in 1817, never receiving a raise or promotion in ten years. His design, however, would last much longer than his tenure at the Mint, appearing on the half eagle until 1834. In 1818, Scot remodeled Reich’s Capped Head half eagle, fashioning an almost identical, but cruder rendition of the original. Scot would remain in the position of Chief Engraver until his death in 1823. When discussing this series, the word “rarity” loses its meaning. Although the Philadelphia Mint produced 1,385,612 business strikes and approximately 150 proofs over a 22 year period, there are no common dates. The 1813 is most often encountered, with many of the several hundred survivors probably saved as first-year-of-issue souvenirs. 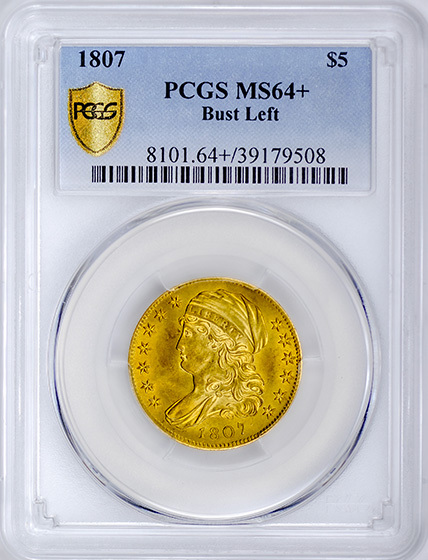 Beginning a list of rarities unique in U. S. coinage is the 1814, with only a few dozen pieces known. 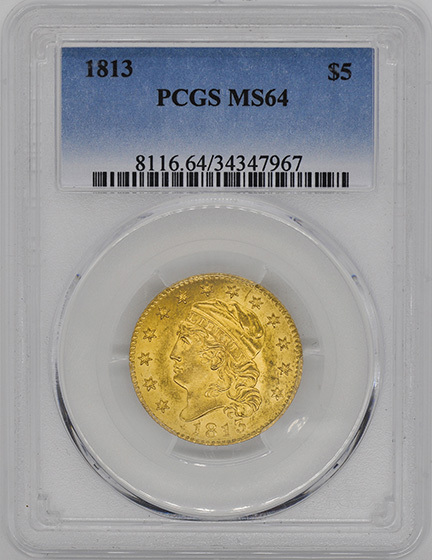 The following year produced one of numismatics’ most celebrated coins, the low-mintage 1815, until this century considered the rarest date in the series. Only 12 pieces survive. It’s believed that 40-50 examples exist dated 1823, making it one of the more “common” dates of this type. For 1824, only 20 or so pieces are known. In 1825, there were two overdates struck: 1825/4 Uneven Date with perhaps 25-30 examples extant; and 1825/4 Even Date, another icon of rarity: only two pieces exist. Both 1825/4 Evev Date half eagles are in private collections, with the second example unknown until 1970, when it was found in a Michigan bank vault as part of the N. M. Kaufman collection. Following this legendary coin are a string of elusive to impossible issues including 1826, 1827, 1828 and 1828/7, with survivors ranging from fewer than six pieces (1828/7) to as many as two to three dozen (1826). The final year of the large diameter coins, 1829, is about equal to 1828/7 in rarity, trailing only the 1822 and 1825/4 pieces. 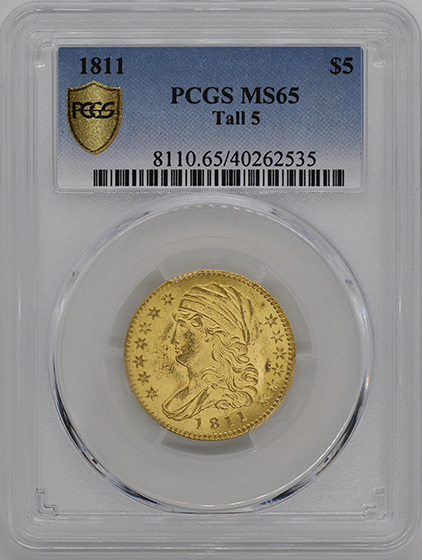 In the summer of 1834, Congress passed legislation lowering both the weight and fineness of U. S. gold coins. More than a generation had passed since half eagles were seen in commerce, and the new, lighter weight Classic Head coins were readily accepted and widely circulated. 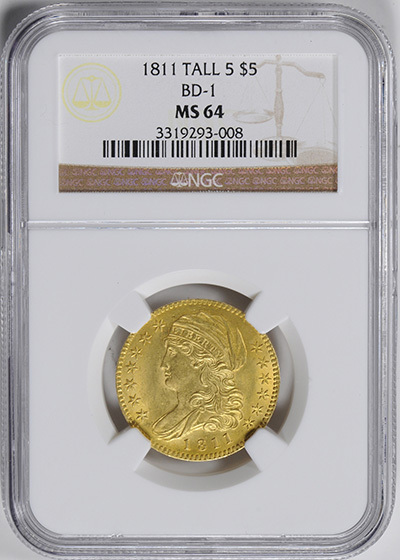 Continuing melts of the old tenor pieces made Capped Head half eagles the rarest series of Federal coinage, and today even a single example is often the highlight of many collections.